It is believed that around 10% of the world’s population are suffering from neck pain at any one time. So it’s no surprise that the market is bursting with lots of different neck massage products for you to choose from, meaning you can enjoy massage therapy at home without having an on hand masseuse! They vary hugely in style and features, therefore to save you time we’ve looked at the market and put together what we think are the best neck massager products available today! Neck pain is one of the four most common types of pain, second only to back pain. Before using any type of neck massager, you should always read the instruction manual. If you are unsure of its suitability it’s best to speak to a medical professional to ensure it is appropriate for your health or medical conditions. Attach to your favorite chair for a massage that mimics the hands of a masseuse. Drapes comfortably around the neck and shoulders for deep-kneading Shiatsu massage. Over 500 different combination settings offering a huge amount of control and customization. We feel one of the best neck massagers on the market is the Brookstone Cordless Shiatsu Neck & Back Massager with Heat, which drapes comfortably around the neck and shoulders. It offers deep-kneading Shiatsu massage nodes as well as rolling massage nodes that can be focussed on your neck or travel the full length of your back, stimulating both sides of your spine. Users enjoyed the varying levels of intensity that the Brookstone Back Massager offered, however they felt a little let down by the fact it only had one speed. Others felt that the highest level of intensity wasn’t quite intense enough, however for everyday relief from pain it was a raved about amongst users who felt it offered everything they were looking for. The LuxFit Neck and Shoulder Massager is a portable and lightweight manual massager with a unique design (it kind of looks like a giant pair of headphones!). It features two silicon balls that deliver the massage deep in to your skin, which is supposed to more closely mimic the hands of a masseuse. If you want to be in control of your massage then this device gives you the flexibility to apply the intensity that you need, which users really enjoyed. Some found that control a little challenging however as they struggled to reach the spot they wanted, but for the low cost they certainly felt it was worth a shot! The eTTgrar Wireless Portable Digital Neck Therapeutic Electric Massager is a snap on neck wrap device. It has over 500 different combination settings so is ideal for the user that enjoys that level of control and doesn’t mind experimenting with different massage, vibration and heat settings. It also offers magnetic field therapy and has a pulse option (offering functionality like a TENS unit). If you want something you can wear around the house day to day, then the eTTgrar Wireless Electric Massager might be a strong option to help you relieve muscle tension in your neck. Some users did find it a little hard to operate at times with so many different settings and combinations, however once they’d worked out how to use it, they described it as addictive! It’s not a conventional looking neck massager, but the Back Buddy has been relieving back pain for over a decade, with many touting it as one of the best neck massagers available. The cane has 11 knobs that have been carefully situated to help you get true relief from the product, accessing your key pressure points to relieve spasms and muscle knots. It’s a great low cost product that many users felt offered great value for money. Users were also surprised by how lightweight the product was and loved the control over the intensity, especially those suffering from myofascial pain syndrome. Some couldn’t maneuver the product as they wanted, so if you do struggle with flexibility, a snap on massager such as the eTTgrar Electric Massager might be preferable. 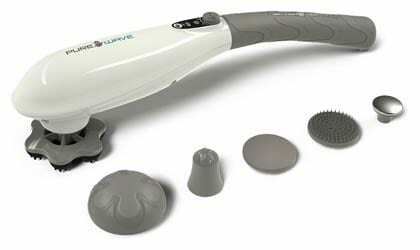 Pure-Wave CM7 Cordless Massager is a handheld wand style massager that comes complete with a number of different attachments including neck massage tools, such as a point stick and air cushion stick. It is a rechargeable device that lasts up to 180 minutes when full charged, and charges up in just 1 hour. One of the attachments included is an oil stick attachment which is ideal for applying creams, as well as essential oils which users found a particularly impressive feature. Some found the device a noisy, with others enjoying the powerful level of massage that the Pure-Wave CM7 can achieve. 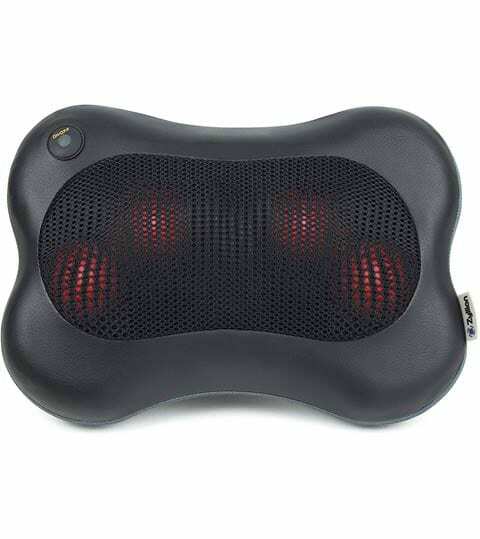 The Zyllion ZMA13BK Shiatsu Pillow Massager with Heat can be easily attached to a chair to provide relief from neck pain. It’s little more than 2 inches deep, so you can easily pop it in your bag and take it with you to work or on vacation. 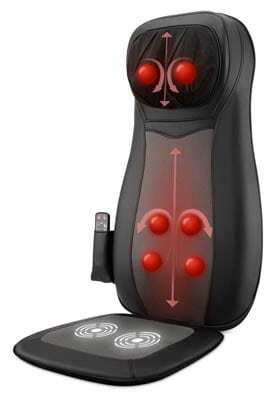 Though it may be a little smaller in size than other massagers, it’s still very powerful with Shiatsu massage nodes changing direction every minute to mimic the hands of a masseuse. Some users found it a little too powerful for their sensitive neck and missed the ability to alter the speed, however those who wanted a solution to their pain at work really appreciated the dinky size. If you want the flexibility of controlling the intensity by hand, or having velcro straps to hold the massager in place, then the Naipo Cordless Massager could be the massage device that you’re looking for. 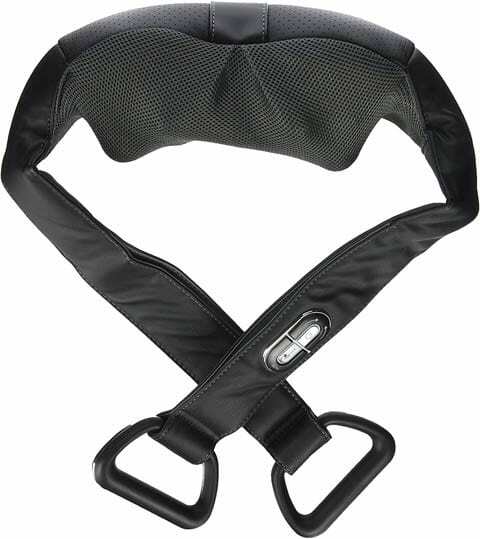 This mid priced item has arm straps as well as a unique velcro design, so giving you the control and the hands-free option. It has three speed modes and four deep-kneading massage nodes which can also be heated to a reasonably high temperature. Users who spend a long time in the car really liked the cordless element of the design, however felt the battery didn’t last quite as long as they wanted it to, which does seem to be a common problem with cordless neck massage products. Those suffering from tension headaches however, could overlook any slight flaw for the relief they felt they got from the product. 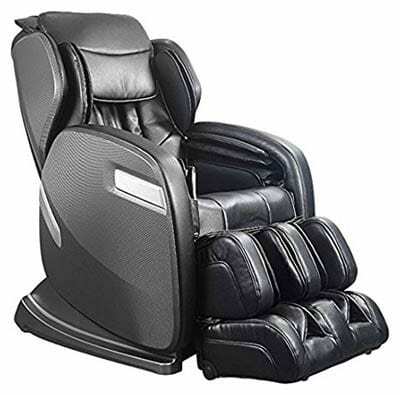 If you’re looking to make a real investment then the Ogawa Active SuperTrac Massage Chair with Advanced Roller Technology brings together 56 air chambers for a compression massage, kneading foot rollers and SuperTrac roller technology plus heat, vibration and stretching features for a complete full body massage. The massaging chair even includes a USB charger! If you want an idea of how far up your neck it will reach, then they recommend a person between 5’ 2” and 6’ 4” is the optimum height for the chair. Of course it’s a big investment however users raved about what an effective neck massage it delivers, likening it to the hands of a real masseuse. Benefits they’d also seen were improved mobility and vastly improved sleep, so worth considering if your pain is keeping you awake at night. The Muscle Stick Advanced Massage Roller is a handy little, low priced stick device that has a stainless steel core, allowing you to apply pressure and massage problem areas in and around your neck. The rolling essentially forces nutrient-rich blood to your problem areas, helping to bring relief from your pain. 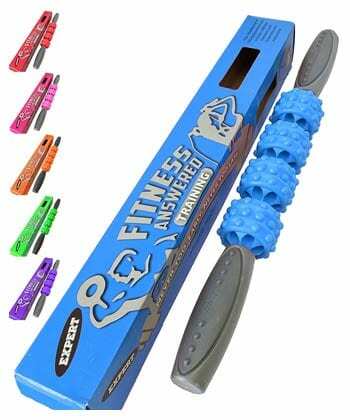 The Muscle Stick massager comes in different colors and has a plastic texture, which some users found a little disappointing as they were expecting more of a rubbery exterior. However for those looking for something handy for pre and post workout the muscle stick was a favorite choice due to the control they have over the intensity. If you’re looking for a massager that is specifically designed for the neck, then take a look at the NURSAL Neck and Shoulder Massager with Heat. It is a cuff massager than wraps nicely around your neck and shoulders, delivering relief through 4 kneading rollers and 2 pinching nodes, as well as a heat option. Users found the massage a little intense, so if you’re looking for a deep massage it could be the right option for you. The heat option was also a favorite feature, with the only real criticism being the short power cord! 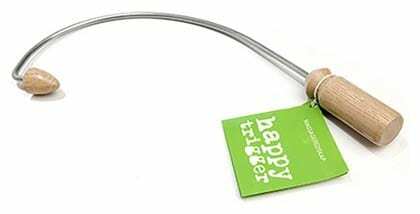 When it comes to interesting design, the Happy Trigger massager is one of the best! It is a handheld, non-electric massager with an almost fishing rod style design! It is made of steel and oak, giving it a stylish finish. The idea of the shape of the hook is to help you massage deeper in those really hard to reach places, relieving your muscle tension and aches. The design felt well made to users who enjoyed the control over the intensity, moving the product with ease to the source of the pain. Some found there was a little too much flex in the product to provide a very deep massage, however as a complement to other massage products it is a strong contender. It’s small too, so perfect to travel with! This FITFIRST Massager Cushion fits on to your favorite chair and delivers your massage through 3D massage balls that can massage your back and neck from all-around angles which they claim is the closest way to get an authentic massage experience. 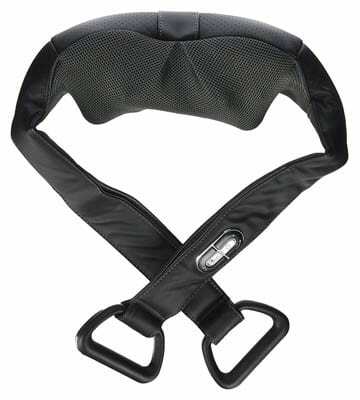 The neck massage element is also adjustable so you can really tailor it to get the most effective massage. Users loved the different tapping and vibration functions as well as the varying intensities that the chair pad offers. It comes complete with a handheld remote that is very easy to operate, plus users reported how quiet it was, making it ideal for use in the office. An alternative to the traditional neck massager is the Nayoya Acupressure Point Mat and Pillow Set which has 7,992 tiny little sharp plastic acupoints, which is designed to stimulate the body in the same way that acupuncture would. We love the neck pillow that comes with the mat as it’s ideal for neck and shoulder pain, as well for those suffering from tension headaches. Older users reported particular success with the product, and said that sleep was improved after using it. Some sciatica users however found it a little too painful, and felt it didn’t get to the route of their problem. 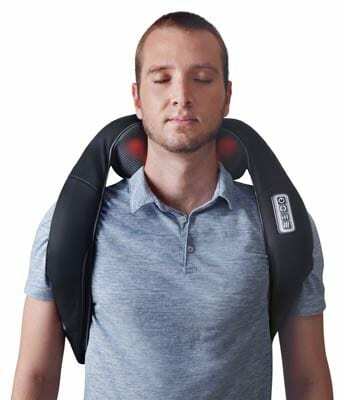 The HoMedics NMS‐620H Shiatsu Deluxe Neck and Shoulder Massager with Heat drapes around the neck and shoulders and offers 3 massage speeds, as well as a reverse feature to change direction in the same way a masseuse would. It has a contemporary design and looks good, which made it a popular choice with younger users. It also comes with a carry handle, making it easy for travel on vacation or to the office. Those suffering from tension headaches really felt it was the best neck massager around as it gave them respite from the daily pain. Others found it a little too intense, so if you’re looking for a lighter massage a handheld massager such as the Happy Trigger might be a better option for you. There are a number of different types of neck massagers available, whether you’re looking for something handy for a recent ache or if you’re looking to make a big investment to deal with chronic daily pain. 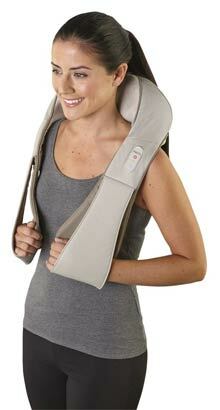 A wrap-around neck massager drapes around your neck and shoulders to truly target the pain. They are available with arm straps so you can apply the pressure you need or velcro straps for a hands free option. A chair massager is a piece of furniture that you add to your home, that you can sit in each day. It’s a big investment but it’s probably the closest you can get to a hands-on massage. The next best thing to a chair massager is a massage pad (also known as a seat topper) that you can attach to your favorite chair. It normally hooks over the back and reaches up to the neck for a deep massage. A handheld massager is normally a wand or pad that you operate and maneuver around your neck to get to the source of the pain. A belt massager can be draped around your shoulders so you can get a deep massage in key areas. A cushion or pillow massager is handy for use on the neck so you can tuck it exactly where you need the relief. More commonly known as a TENS unit sends low voltage electrical impulses across the skin that stimulate the nerves. 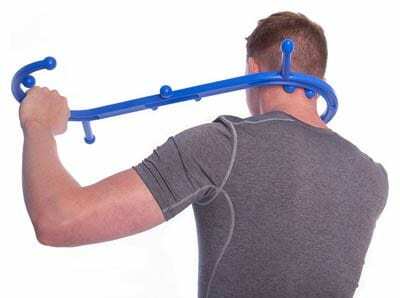 A cane massager is a simple device which can be maneuvered to the right part of the body to provide relief. A wooden ball massager is rubbed on the problem area to provide relief. The wooden balls are run up and down the skin to release tension. An S shaped massager is a stick massager which normally has carefully placed nodes so that the massager can be maneuvered to the exact right position. A 3 prong mini massager is a simple handheld device that can be used to work out knots and tension in the neck. A foam roller has a hard or soft exterior depending on the relief needed. It is rolled up and down the affected area to release tension in the muscles. The shape of the neck massager is important as you need to make sure it can really target the source of your pain. Whether it’s an S shaped stick or a chair pad, you need to make sure it can reach where it needs to go. You also need to consider the size, will it give your neck good coverage? Is it too large to be portable? All should be considerations to make the right choice. As well as size, weight might be a consideration as you may be draping the device around your neck, or trying to manoeuvre it on to your neck. Certain neck massagers come with arm straps, these are so you can control the pressure needed. Velcro straps are another feature offered with wrap-around massagers, that help you position it in the right spot without having to hold it in place. Consider which option is right for you, whether you want to use your massager on the go, or just ensure you can use it in your favorite chair! The number of massage nodes that the device offers may be important to you if you’re looking for a deep and intense massage. Percussion is a style of massage and users have described this technique as “thundering on your back”, so perfect if you want a deep tissue massage perhaps not ideal if you’re looking for something a little less intense. Look for this feature, a Japanese massage technique, if you want to replicate the hands of a masseuse as closely as possible! Some neck massagers include an optional direction mode so the nodes can change direction for a more satisfying massage. Massagers which offer magnetic field therapy as a function essentially include magnetics which, when placed on the body, are believed to improve the natural magnetic energy within us, you can learn more about it here. If you have knots and want a massage that is really going to work them out then you might want to look out for the kneading function. If you want hand-held control then you may opt for a wand massager or a unit that includes a wand. Some units offer an additional vibration function which might be something you want to consider for that added extra relief. Heat can offer comforting relief from pain as it heats the skin which stimulates the sensors and blocks the pain signals being sent to the brain, many different massagers include this option so it’s worth looking out for. Infrared heat is also a feature offered by some devices. A timer can be handy if it takes you a while to get to the source of your pain, so you can set a period of time and then just sit back and enjoy the relief. Auto Shut Down can be great as it protects you and the unit from overheating, however if it takes you a while to get to the source of your pain, a short auto shut down could be frustrating. If you have good days and bad days and want a massage that can flex with you then you want to look for a massager with a selection of intensity settings. Some devices only come with one setting so make sure you choose what is right for you. As well as intensity settings you need to look at what speed settings are offered if you want something fast and rigorous or if you’re looking for something slow and gentle. Some massagers are rechargeable making them handy to be used in the office or on the go, look closely at the length of time advertised when the product is fully charged. You may also want to consider the speed at which the product goes from flat to fully charged, as that may be something that’s important to you. If you’re wanting to take the massager on vacation or use it at work then a portable option might be the one you’re looking for, that is an appropriate size and lightweight. You can also choose a massager for in the car, however this can only be used when stationary or as a passenger. Using your device in your car, between meetings for example, might be important to you, so look for a neck massager that comes complete with an in car charger. It may seem an unimportant feature but if you want to use your neck massager in your favorite chair then the length of the power cord is important so certainly worth checking. Some massagers come with attachments to target different areas, such as the face, or with oil stick attachments to allow you to apply creams or essential oils which may be an important feature for you. If your pain is hard to reach and you get the intensity just right it can be frustrating to have to go through the various settings each time. Memory / recall functions remember the intensity, speed and style of massage you enjoy which can be helpful day to day. Another extra that may be offered with your neck massager product is an instructional video. It may sound like just a nice-to-have but if you want to get the most from your product then it can be a handy extra. Of course those who suffer from neck pain will benefit from using a neck massager. 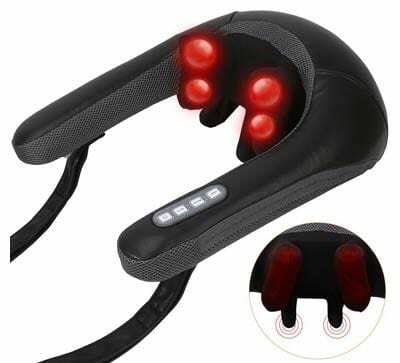 Neck massagers mimic the hands of a masseuse stimulating the muscles and nerve endings. Research has shown that massage therapy is an effective treatment for chronic neck pain, and a neck massager is essentially simulating this technique. Women are more likely to experience neck pain than men. 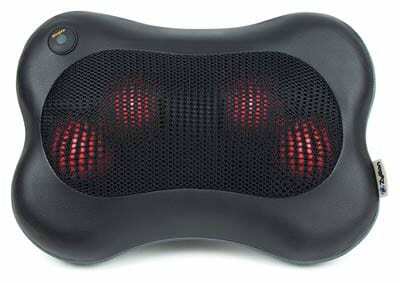 As well as providing relief from neck pain, a neck massager can also work well for shoulder pain. Shoulder pain is one of the most common pain complaints reported in the U.S., and by stimulating the muscles with a massager it is believed that this provides relief. Whether you get a stiff neck occasionally or you suffer from chronic daily pain you’ll understand how uncomfortable it can be. It is believed that around 10% of the adult population are suffering from a stiff neck at any one time, with massagers being suggested as a natural way to treat the pain. Tension in the muscles can also be relieved by a neck massager whether in your neck, shoulders or back. Massage as a therapy is used both as a treatment and a preventative method. Tension headaches are the most common type of headache in the world, and often cause both neck and shoulder pain along with pain in the head. Massage therapy as a concept is believed to be an effective treatment, however as the neck is incredibly sensitive when you suffer from this condition it’s important that you speak to your doctor before beginning treatment. Massage therapy can be an effective treatment for arthritis, however for certain forms of severe arthritis in can have a negative effective so it’s important to consult with your doctor. A neck massager is a device that comes in many different forms, it could be a wrap-around massager that can be draped around your shoulders or a chair pad that you fit in your home. 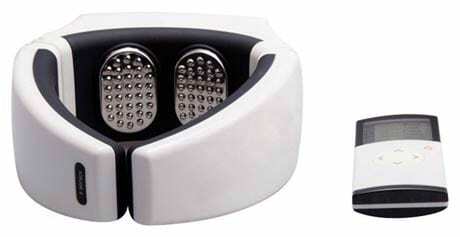 Essentially it mimics the hands of a masseuse to provide you with daily relief from pain. What does a neck massager do? A neck massager replicates the hands of a masseuse on your neck, stimulating your circulation and relaxing stiff muscles to give you daily relief from pain. Different styles of neck massager use different massage techniques and intensities. How do I choose a neck massager? Choosing the best neck massager can be tricky as there are so many different ones to choose from and various features that you need to consider. Firstly think about what you’re hoping to achieve from investing in a neck massager then use our handy information above to find the exact one that’s right for you. Can I use a neck massager while pregnant? It is always best to check with your doctor before using a neck massager when pregnant as advice is mixed. Overall the consensus appears to be that a hand-held, non-electric massager is best, avoiding functions such as vibration, deep tissue massage and heat treatment. It goes without saying that you should always read the instructions before using any massage product for any other warnings or precautions. Do you have to be a certain height to use a neck massager? Certain massagers, like chair massagers and chair pads only reach a certain point on your neck so normally come with advice about the ideal height of the user and any limitations it might have. Other wand and wrap-around massagers aren’t limited by the user’s height. Can you use a neck massager on other areas of your body? Yes, depending on the type of massager you choose. Certain neck massagers come with different attachments for your shoulders and face, others can be draped around the shoulders as well as around the waist for lower back pain. Can you drive while using a neck massager? Advice from neck massager product manuals indicates that it’s not advisable to use a neck massager while driving. However you can buy massage cushions for your car seat that you can use when stationary or as a passenger. Neck massagers vary widely in cost, so think about how much money have to spend before you make your investment. Prices tend to vary, with simple massagers costing from only $10 as opposed to massage chairs which tend to cost over $2,000. Where can I buy a neck massager? You will find neck massagers for sale online, and are widely available on many websites, such as Walmart, CVS, Target and Walgreens. If you want to buy a neck massager locally, visit your nearest pharmacy. Several online retailers offer free shipping on orders as well. We hope our handy guide has made your buying decision a little easier, but more importantly, that you find that perfect product to give you relief from your pain. Good luck! Next TechCare Plus 24 Review: How Simple And Effective Is This TENS Unit?